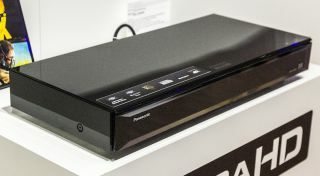 Panasonic’s 4K Blu-ray player to cost £599 and go on sale in April | What Hi-Fi? Panasonic's European convention is currently under way in Frankfurt and the company has finally divulged some key pieces of information about its brand-new 4K disc spinner. The DMP-UB900 will cost £599 (we were originally told it would be under €1000/£730) and the machine will be available to buy in April. But that's not all. Anyone who splashes the cash on the player will get a couple of 4K Blu-ray discs thrown in as part of the deal - Mad Max: Fury Road and San Andreas. Panasonic already has the DMR-UBZ1 4K Blu-ray recorder on sale in Japan, but this is the company's first machine dedicated purely to disc playback. As we reported back at CES in January, The DMP-UB900 is capable of playing Ultra HD Blu-ray discs, with support for 4K/60p playback as well as HDR (High Dynamic Range) video. It is THX Certified, has a wide colour gamut of BT.2020 and a brightness range of up to 10,000 nits. In short, the Panasonic 4K player promises to deliver finer detail, vivid colours and better contrast between light and dark areas than ever before. We can't wait to test it. The DMP-UB900 will also support 4K video-on-demand services. While the services haven't been officially named yet, we're hoping that Netflix, Amazon Prime and YouTube are on the list. There are twin HDMI outputs, an optical output, and 7.1-channel analogue audio outputs. It's not all about the 4K video resolution, though: the player is equipped with five 24-bit/192kHz DACs for each channel, and can support all popular hi-res formats including ALAC, FLAC and DSD (5.6 and 2.8 MHz). Music files can also be upsampled. The DMP-UB900 is a fully networked player, with built-in wi-fi and DLNA on board, meaning you'll be able to stream music and videos from compatible devices. You can also share and watch 4K footage shot on a compatible camera. And finally: there is a backlit remote control.